Prof. Taylor Thom and Richard Field of Princeton's Geology Department initiated the "Red Lodge Project" in 1930 for the "furthering of fundamental geological science and the training of students under exceptionally favorable conditions." There were 19 active participants. Red Lodge was chosen because of its superb geologic setting in an area that was then relatively unknown. Dr. J. C. Fred Siegfriedt, a Red Lodge doctor and mayor, known as an amateur paleontologist, owned some land near Piney Dell, about five miles southwest of Red Lodge, which he rented as a field station to Taylor Thom in 1931. That year 35 participants and the following year 42, together with family members, occupied the one old house, small cabins, and tents at Piney Dell. For the next 30 years, Roy Wadsworth, a giant of a coal miner - carpenter, and his wife Florence served as repairman, caretaker, and cook. Participation by many geologists and students from 17 colleges and universities during the first three years of the Red Lodge Project forced the search for new quarters. A dude ranch, Camp Senia, 12 miles up the West Fork valley provided space for the 1933-1935 field seasons. In searching for a permanent location closer to Red Lodge, Thom learned through the Northern pacific Railway Company in 1934 of a canceled grazing lease available on the slopes of Mount Maurice. The total price for the 120 acres would be $420. A newly formed Princeton Geological Association (PGA) raised enough money to purchase the site (although there is some question whether the funds were ever paid) and in 1935 construction on the new camp was begun. By the summer of 1936 Roy Wadsworth and his helpers had finished the lodge, a shower house, and fourteen other cabins. A reservoir was built along Howell Gulch, named for Benjamin F. Howell of Princeton, who assisted Thom in choosing this site. According to archival records, the total cost was just over fourteen thousand dollars, including lumber, labor, furnishings, and materials. To celebrate the opening, the 75 camp residents hosted 175 Red Lodge guests to a pig roast on July 17, 1936. 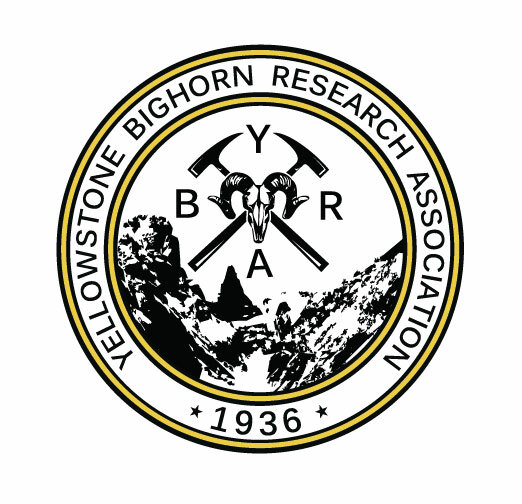 On July 14, 1936, the Yellowstone-Bighorn Research Association (YBRA) was incorporated as a not-for-profit organization in the state of Montana. Although it never has exercised the option to do so, YBRA is authorized to grant degrees. On November 21, 1936, a five-year lease on the camp was granted to the YBRA by the Princeton Geological Association. During the early years financial support came from Princeton University, Carter Oil Company, the Northern Pacific Railway, other universities, and many private individuals. In June, 1941, the PGA gave the YBRA an option to buy the camp for $4,000. That option was accepted and on April 24, 1942 the camp property was transferred to YBRA. A resolution was passed by the PGA to reduce the selling price to $1.00 because of efforts already made by participants during past years. During the first 50 years there were at least three dozen doctoral theses produced out of this area by students from Cincinnati, Columbia, Johns Hopkins, Minnesota, Princeton, Wisconsin, and Yale, among others. Undergraduate students participated as field assistants in most of these projects. Since the mid-1950s, undergraduate field courses have been conducted at YBRA by numerous schools, including the Princeton-YBRA field course (now the University of Houston-YBRA field course), Southern Illinois geology and botany courses, the Penn State University geology program, the Harvard/Yale geology program, and others. Since the late 1970s, several universities have conducted alumni colleges for their graduates and friends. These week-long programs have introduced many non-geologists to the area's geology and natural history. Begun by Princeton, alumni colleges have now been run by Amherst, Franklin and Marshall, Southern Illinois, and Johns Hopkins universities. In addition to their academic and social values, these programs have made outstanding contributions to maintaining the financial integrity of YBRA. Although research has taken a secondary place to education during the last few decades, numerous graduate and faculty research programs continue to use the YBRA facilities for parts of every field season. Summer institutes for teachers have been held at YBRA, conducted during the 1970s and 1980s primarily by Prof. Erling Dorf of Princeton, and Prof. Will Parsons of Wayne State University. Other uses of the camp have included a writing conference by the American Geological Institute, field conferences and symposium meetings of International Geological Congresses and the Billings and Montana Geological Societies. Yellowstone-Bighorn Research Association (YBRA), a non-profit organization dedicated to earth sciences research and field education in the northern Rocky Mountains of Montana and Wyoming.